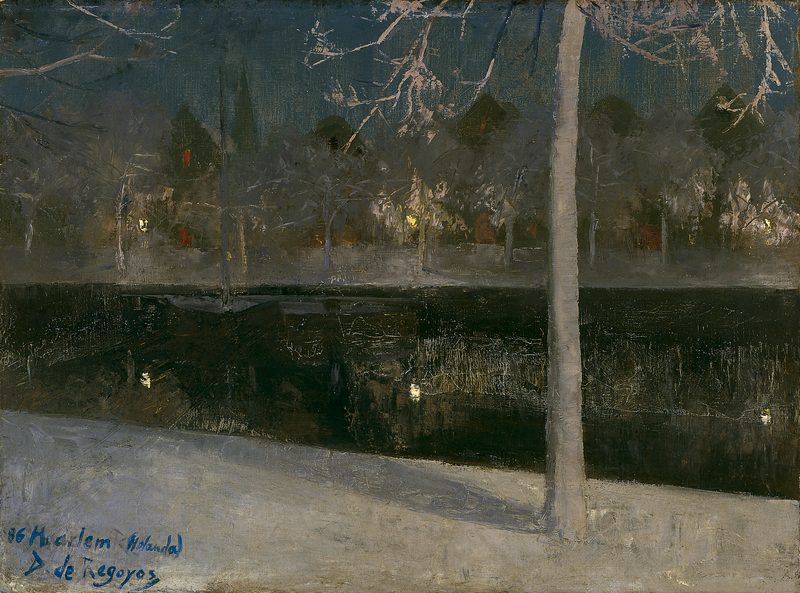 Snowy Landscape by Night is a view of a canal in Haarlem in January 1886. In it, Regoyos masterfully captures the atmosphere of stillness and solitude that enveloped the scene during a cold winter's night with newly fallen snow. The approach to the composition is familiar to us from other paintings by Regoyos. The pictorial space is subdivided by diagonal and horizontal lines, while he adopts a viewpoint above eye level. Regoyos used light effects and shadows as vehicles of expression, creating appropriate contrasts and achieving an extraordinary sense of harmony. His love of light effects is evident even in his earliest work, and he painted numerous oils on similar subjects. The influence of foreign artists evident in works of this type was in part a product of the painter's close friendships with poets and writers like Émile Verhaeren, Maurice Maeterlinck, and Georges Rodenbach, who represented the Symbolist movement in Belgian literature. Particularly significant in this regard was his relationship with Verhaeren, with whom he travelled in Spain in 1888, a journey that resulted in the publication of La España negra in 1898. Regoyos began work on a series of paintings of the same name in 1888. The painting presented here is described in detail in the book dedicated to the painter by his closest friend, the journalist and author Rodrigo Soriano. "In Haarlem, Darío painted one of his boldest pictures. Irrepressible as he was, the artist made no concessions, either to the weather or the time of day. At dusk on a day in January -and that in Holland! (it was so cold that one's breath froze), we went to the banks of a canal, where we saw an old boat stripped of its rigging. The banks were covered with snow. Slate roofs like spearheads bathed in silvery moonlight were visible through the trees. A few small lanterns cast an eerie, shimmering light on the water and snow, enveloping the trees in hues of pink. The painting captures this mood precisely, with all of its magical effects and the delicate tenderness of its colours, like a dream of a pole that caresses the imagination".